Please enlarge any photo, especially this one! Faunal Associations~ Bees, lots of bees, short tongued and long tongued; important predatory wasps; skippers and butterflies; goldfinches and other birds eat the seeds. Give it plenty of sunshine and it will be a great architectural plant in your sunny beds. It towers above the Susans, but, who cares! I love that it feeds so many critters. Have a delicious day and plant more natives! The critters will thank you! Lovely shots, dear Gail, especially the gorgeous one with the happy bee. I've been outside stalking the bees and hummers this morning, with mixed success. They're all very busy and photoshy. Beautiful - did you get any full shots of it? Lovely plant, very similar to the helianthus growing around my farm. I don't think I have any of these in the fields but I'll keep my eyes peeled. It's gorgeous! I will be on the lookout for it. Great shots of the bees! Great photos! How do you get the bees to sit still? Happy Wildflower Wednesday! I have never thought of bees as either short or long tongued. I don't know much about their anatomy except for those stingers and pollen collecting/spreading bodies. Nice photos. Neat plant! Did you plant it or did it appear on its own? A great plant, Gail! 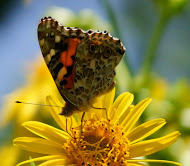 I'm sure it's a great punctuation mark to the Susans garden, and the color matches perfectly! I'm not familiar with this plant, but it certainly seems welcoming to pollinators. Beautiful photos. And so close up! Everyone! Thanks for popping over for a visit and leaving a comment. Cup Plant arrived in a 3 inch nursery cup with a a label that read Cup Plant full sun! I did read about it but thought it would remain on the shorter side in my 'not prairie soil'. It is now very tall over 7 foot and should have been staked, because heavy rains made it fall over. Town Mouse, Thanks for thinking about my thumbs! What a great plant you have posted today....I linked to you again with an apology..now I have two mysteries to solve.. I had one of these many years ago. I had forgotten all about it. Thanks for rattling my old brain. Interesting plant and great photos. Beautiful pictorial Gail. Love that yellow, and the picture with the two bees! Which bees have short tongues? I have to admit that I often don't know what species I'm looking at. 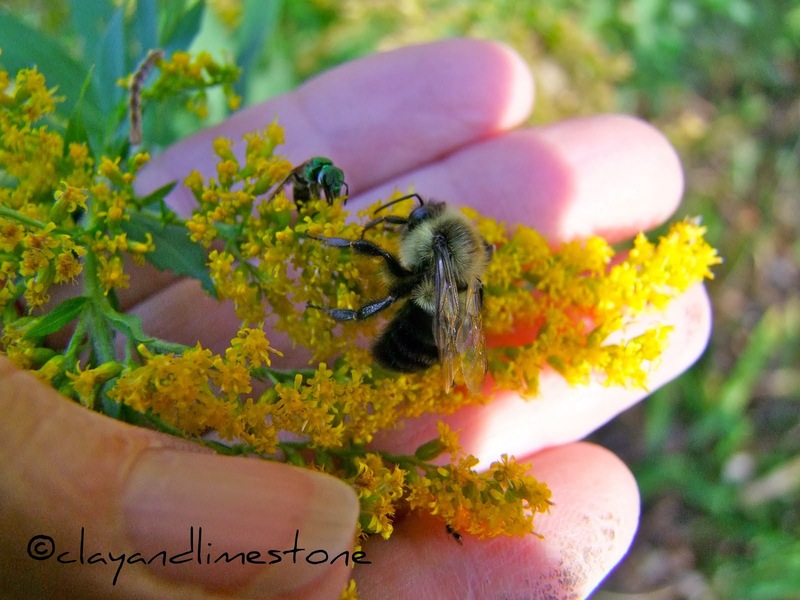 The Carpenter Bees are the biggest, then there are bees that look exactly like them but are smaller, small bees that are fuzzy all over... Many seem to have long tongues, which they leave out as they are flying from flower to flower! Sweetbay, I know that carpenter bees and honeybees have long tongues and I suspect any bee that can get into a flower that is pendulous or has a a deep cup! The short tongued bees are seen on the open flowers like the evening primroses....but that's all I really know! ;-) I thought your bee photo in your latest post was wonderful! Gail, I'm so glad you posted this! Beckie and I visited the prairie area at our favorite park again last week, and the cup plant had just started to bloom. Their leaf arrangement make them much easier for me to identify than so many of the other yellow natives. Speaking of natives, one of these days I'm going to do a post on all the weeds growing at the back of our farm:) One of them is a thistle which my husband fully intends to cut down, but it has pretty purple blooms, and the goldfinches and butterflies just love it! I don't recommend growing thistle, but it is a native here, too. It's a beautiful flower. You're reminding me that it's time to go back to the NC Botanical Gardens where they grow native plants. I love plants that the creatures flock to too. What a great bonus! Another new plant for me Gail. I like the common name and I think I see how it got it. Very much an architectural element if it stands 7' tall! You have so many wonderful natives in your garden ~ you have to feel good about the creatures who visit knowing you had a hand in them showing up. I'm seriously considering a bed overhaul so I'll have to think hard about what the new one should have in it/look like. I enlarged the suggested shot and really liked the fact that you can see what looks to be a honeybee circling in the background waiting for the bumble to move. Your bees seem to be posing so nicely! I read an article yesterday that said we should be putting out energy drinks (Gataorade) to revive exhausted bees. I think they'd prefer these flowers, personally. I'm glad I followed your advice and enlarged that photo - the tiny bee trying to land made me laugh. I love seeing Silphiums in the prairie areas around here. You've taken some wonderful photos of them. Great looking plant. That sure is a cute little fellow sitting there. I am always amazed at how tall the Cup plant gets. Great shots Gail! Hi Gail! I just learned about the Cup Plant early this Summer. It's a beauty and a wonder, isn't it? Not only seeds but water for a variety of wildlife in the cups! It's all good Gail and so nice and cuppy. I'll do my best to plant more natives. I'm bored with my business so I am trying to get a job with a local nursery who specializes in native plants. Help me HOPE I get it. The owner is the most knowledgeable man and will be loads of fun to learn from. I might find out in a few weeks.